burdenon society: why cheat ? There was something in the title of this article that initially sounded appealing: a "cheater's guide" as if this information would give you (dear reader) an edge to living well and long. But it did not sit well with me, because there is no need to cheat to have the benefit. And (not less importantly), cheating is unfair and is simply not ethical. My impression of "cheating" that might give you a temporary advantage, lives in a "win-lose world". 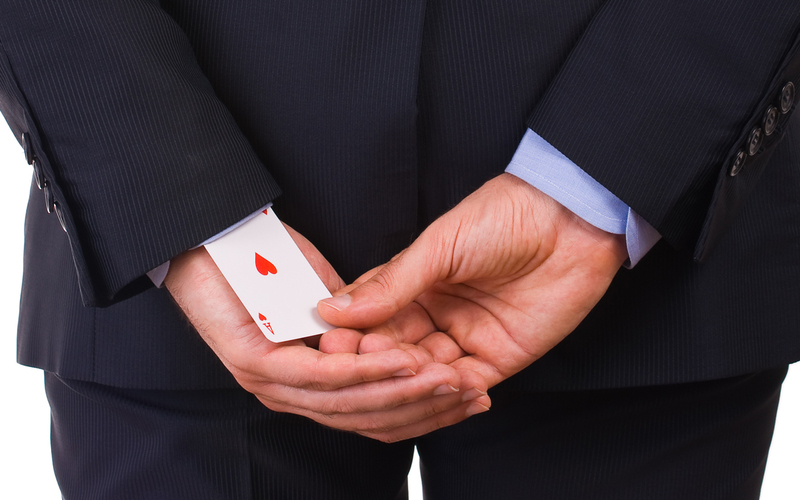 In a world where "win-win" is allowed, there is no need for cheating. I do understand that sometimes there is a perceived need to have a provocative eye-catching lead to grab eyeballs; boring headlines are ignored. But there seems no need to endorse fundamentally unethical behavior. Do something else, please. You turn 50 and suddenly you’re pegged as “middle-aged.” But what if it really was the middle, and you could expect to live to 100 or even 120? Don’t laugh. There are 53,364 centenarians in the U.S. today, according to the latest Census Bureau figures, and experts estimate that number could skyrocket to 600,000 by 2050. Better yet, many of these oldsters will defy the doddering stereotype. Take Jeralean Talley of Inkster, Michigan. She was still bowling at 104 and getting around with the help of a walker last May—when she celebrated her 115th birthday. Last year, UnitedHealthcare polled 104 people who’ve reached triple digits and found that not a single one felt sad or burdened, or even particularly old. On average, they said, they felt more like whippersnappers of 83. Interested in joining this club? Enter journalist Dan Buettner. He has spent over a decade studying the healthiest, longest-living people around the world, from residents of the Japanese island of Okinawa to the Greek island of Ikaria—so-called “Blue Zones,” or longevity hotspots (Sardinia, Loma Linda, Calif. and Nicoya, Costa Rica are the others), where people live to 100 or older at much higher-than-average rates. Since 2009, Buettner has taken the Blue Zones lessons to a few U.S. cities, transforming their residents’ health. Now, he’s letting the rest of us in on their secrets in his new book, The Blue Zones Solution: Eating and Living Like the World’s Healthiest People (National Geographic Books). 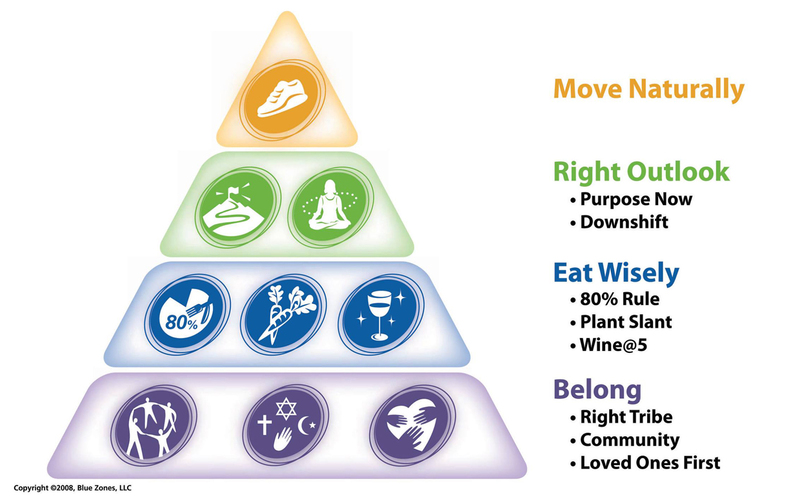 Here are the most important longevity-boosting habits of centenarians around the globe. Adopt even a few, and you’ll stand a better chance of celebrating your 100th birthday. “Who you hang out with trumps just about everything else when it comes to your health,” says Buettner. He found that the people who live longest surround themselves with people who support healthy behaviors, and other research backs that up: When psychologists at Brigham Young University reviewed 148 studies on social relationships, they found that those with stronger connections were half as likely to die as those with weaker ties during the study periods. One explanation: “Health habits—both good and bad—can spread like a contagion,” says Noah Webster, Ph.D., an assistant research scientist at the University of Michigan’s Life Course Development Institute for Social Research. Centenarians from Blue Zones also take advantage of the life-giving power of social connections in other ways: They belong to a faith-based community (attending services four times a month can add up to 14 years to your life, Buettner says) and have close-knit families. The world’s most robust 100-year-olds stick with diets that are 95 percent plant-based, says Buettner. “They eat a little meat, but mostly fish,” he says. British researchers tracked 65,000 people for 12 years and found that those who ate seven or more portions of vegetables and fruits every day lowered their risk of dying from the two leading causes of death—cancer and cardiovascular disease—by 25 percent and 31 percent. “Protein, especially from animal sources, activates two sets of genes that accelerate aging,” says Valter Longo, Ph.D., director of the University of Southern California’s Longevity Institute, whose studies have shown that people with the highest protein intake have the highest risk of cancer and mortality compared with those who eat the least. 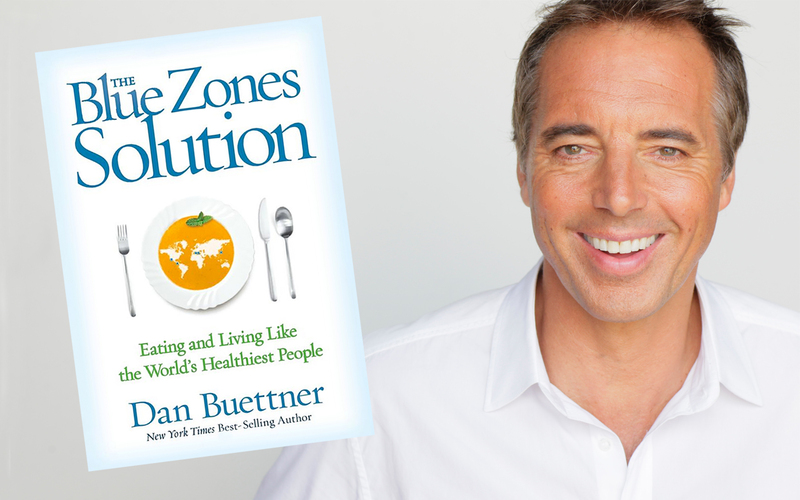 Blue Zones centenarians approach eating differently, too, says Buettner. Before every meal, Okinawans invoke a 2,500-year-old Confucian mantra, known as hara hachi bu, to remind themselves to stop eating when they’re 80 percent full. People in the Blue Zones also eat their largest meal in the morning and their smallest at night. As for beverages, most Blue Zones centenarians have a glass of wine a day—a habit that research shows boosts longevity. Very old Blue Zoners share another trait: They have an activity, passion or career that motivates them and gives their lives meaning. “Okinawans call it ikigai, and those who live in Nicoya, Costa Rica, call it plan de vida, both of which mean ‘Why I wake up in the morning,’” says Buettner. In one 14-year study, researchers found that the 569 participants who died had scored lower on ratings of life purpose and social relationships than those who survived. Their conclusion: Having a purpose in life provides a buffer against mortality, no matter your age. Having a sense of purpose might contribute to longevity by lowering the stress hormone cortisol. “Chronic stress leads to inflammation, which is associated with every age-related disease,” Buettner says. It’s no surprise that physical activity also keeps Blue Zoners young. What is unexpected: “They don’t exercise, per se,” says Buettner. “Instead, their lifestyles encourage physical activity.” They garden, bake bread from scratch and walk to the store or to work. Of course, structured exercise is healthy, too—it can extend life expectancy by 4.5 years, according to a 2012 study by the National Institutes of Health. If you don’t already have a regular routine, consider starting a walking moai. Brian Mattson, 44, of Albert Lea, Minn., has participated in one since the Blue Zones crew came to his town seven years ago.